If you've spent more than 10 seconds on Pinterest, you've probably seen photos of food layered into canning jars. It looks so pretty, right, with multicolored salads or desserts? The current cookbook on my reading list, 150 Best Meals in a Jar , puts every possible thing you can think of in a jar - soup, salads, main dishes, pasta, rice bowls. There is shepherds pie and lasagna and paella and spaghetti. 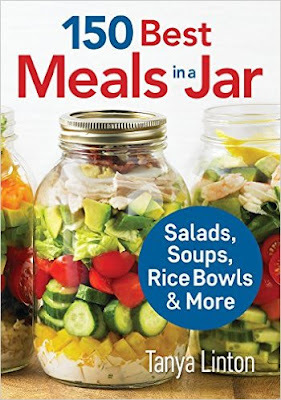 The more I look at this book, the more I think that some foods just don't belong in jars. The salads make some sense, except that if you plan on eating it out of the jar, you're going to be eating one layer at a time rather than getting that perfect bite of lettuce and tomato and cucumber. But carrying salad in a solid container is a good idea, and dumping it into a bowl is fine. You want it all mixed up, right? Shake the jar to coat it with dressing and then pour into a bowl for serving. Perfect. On the other hand, the shepherd's pie confused me. Not that it wouldn't look pretty layered in a jar. It would. But ... how do you eat it? If you eat out of the jar, you're going to be eating one thing at a time, starting with the potatoes that are on the top. If you dump it out, it's not going to be pretty at all. Which I guess it's not horrible if you're eating at your desk at work. But there are other options. The other odd thing was that the recipe makes 2 servings and each serving fits into a quart jar. That seems like a lot of food to me, but I don't eat as much as I used to. Soup in a jar makes sense to me, but my quibble is with the serving size. Many of the soups call for a quart jar for a single serving. Maybe the recipes don't fill the quart, but in that case, why not adjust the recipe to make ... oh, let's say two full pint jars? Or a pint? Or three pints, since most recipes say they can be kept refrigerated for three days. If someone is happy eating a quart of food for lunch, that's perfectly fine with me. I just thought that it was a pretty big serving size to use throughout the book, particularly since there are some recipes that use pint jars or smaller. The recipes are interesting. Components are cooked separately then put into the jar to be microwaved later. This makes sense with foods where you want the separation of flavors. But method is also used for soups. Components are often put into the jar and a prepared broth poured over the top. So you're not cooking and tasting and then putting it in a jar for lunch. Instead, you're assembling and relying on the recipe to give you something that tastes good. It's not the way I cook, but I think some folks would really love this idea - they get a lunch that isn't a leftover from dinner. The desserts, made in small jars, look pretty good. The salads make sense, if you're going to dump them into a bowl or on a plate. The soups make sense to eat (or drink) of of a jar. But I'll admit that some of the main dish recipes puzzled me. Rice and other ingredients layered in a jar isn't paella. It might be good, but it's definitely not paella. And for many of them, although I could see how they'd be pretty while they're layered in a jar, eating them would likely require dumping them out, which would make them look so much less attractive. Considering the popularity of food in jars, I'm sure there are a lot of people who love this style of cooking. For me ... well, I work at home, so I don't really need to make my food ahead and carry it with me, so it's not as useful for me. Interesting, though.